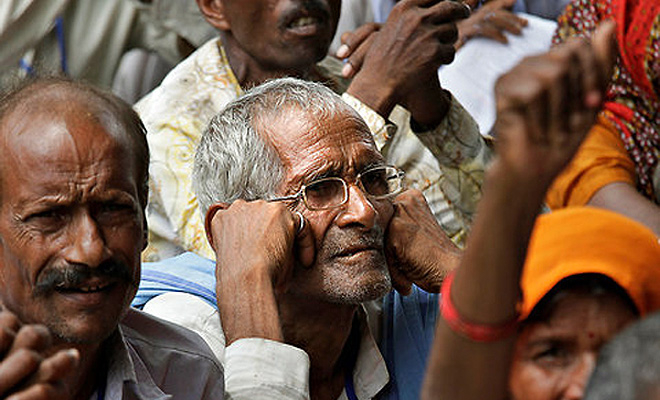 The Great Pension Scandal: A Laughable Pittance of Rs 200 a Month! In keeping with the spirit of the Constitution, State-funded pension must be a right for every person, and must be financed by budgetary sources, unrelated to any contribution from the beneficiary. Incredible as it may seem, the Union government provides a pension to the elderly which amounts to an absurd sum of Rs 200 each per month, and even for accessing this the beneficiary must belong to the BPL population which, as is well-known, is notoriously underestimated. True, the state governments add something to this amount, but, their resources being meagre, the additions cannot be large. What is more, this figure of Rs 200 has remained unchanged since 2006-07; even the elementary courtesy of indexing it to inflation has not been accorded to the elderly. This is truly a scandalous state of affairs, not just because the sum is laughably paltry, the beneficiary list absurdly truncated, and even elementary protection against inflation missing, but above all because of what it reveals about the government’s attitude. This attitude sees the payment of pension as a largesse on the part of the State, an act of charity towards a set of mendicants. But an adequate old-age pension is actually a right. It is a right not just in an abstract “ought”-sense, but in the concrete sense of being an integral part of the social philosophy which underlay India’s anti-colonial struggle and upon which the Indian constitution is founded. Also Watch: Demand for Universal Pension: "We Are All on Our Way to Old Age; This is Everyone’s Issue"
This philosophy which the Left has always espoused holds that the plight of an individual in society is determined by the social arrangement within which he or she lives. For instance, unlike the colonialists of the pre-independence era who attributed the misery of the Indian people to their “laziness”, or lack of enterprise, or subservience to tradition, the anti-colonial struggle advanced the proposition that it was the colonial arrangement that caused the abject poverty afflicting India, whence it followed that this arrangement had to be altered by overthrowing colonial rule and erecting an alternative social arrangement that would guarantee a minimum standard of life to every Indian. The Karachi Congress Resolution in 1931, which outlined what free India would look like, held out this promise, among others. The mass participation in the freedom struggle that occurred in the 1930s was fired by this promise, which thus became a sort of “freedom charter”, upon which the new nation was founded. It acted as a precursor to the constitution. Even though the Constitution did not explicitly codify a set of fundamental economic rights, as it codified a set of fundamental political rights, the former cannot just be wished away, both because they form part of the “freedom charter” underlying the new nation, and also because the latter cannot be enjoyed without the citizen also enjoying a set of de facto economic rights. The assertion of one’s role as a citizen in a democracy cannot occur unless one enjoys a degree of economic security. Hence, even though economic rights are not codified as such in the Constitution, they are implicit and as fundamental as the explicitly-codified fundamental rights. Adequate pension to the elderly is one such economic right. It is inherent in the promise underlying the Constitution of free India which is visualised as a fraternity of equal citizens. Within this fraternity of equal citizens, nobody is doing anyone else a favour by accepting a legitimate demand for a minimum livelihood. If adequate pension is an economic right, then it must be universal, like the fundamental political rights enjoyed by all. The pension scheme cannot be either contributory or means-related. It cannot be targeted, not just because any targeting invariably leaves out many deserving beneficiaries, but, more importantly, because it violates the principle of universality that must characterise all rights of citizens. To be sure, in fixing the amount of pension, the fact that a person is already drawing a pension from some other source must be taken into account; and once deduction is made on that score some will automatically get excluded or drop out, but that does not amount to an infringement on a person’s right. Likewise, the pension paid by the State to every elderly person as a right must have nothing to do with any contribution from the person concerned. If someone is part of some other contributory pension scheme, he or she may opt out of the State-funded pension, or the pension amount may be suitably adjusted to prevent double benefits; but State-funded pension must be a right for every person, and it must be financed by budgetary sources, unrelated to any contribution from the beneficiary. The provision of a laughable pittance as pension, as is the current state of affairs, is therefore a violation of the spirit of the Indian Constitution, a throwback to feudal times when rulers occasionally showed kindness to the ruled by bestowing favours upon them, of the sort that our governments think they are doing in providing a pittance for a pension. The Pension Parishad, a network of several groups, organised a dharna in Delhi on September 30 and October 1, to demand an adequate universal rights-based pension. The principle enunciated by the Pension Parishad is that the amount should be half the minimum wage, but in concrete terms the demand was for a pension of Rs 3,000 per person per month. The Pension Parishad has organised a similar dharna in 2012 when the demand had been for a universal pension of Rs 2,000 per month. Taking into account the price-rise in the interim, the current demand of Rs 3,000 is roughly equivalent to the demand of Rs 2000 at that time. The appropriateness of this figure can be seen from a different angle. Since poverty in India is defined in terms of a daily calorie-intake norm, namely 2,100 calories per person per day in urban India and 2,200 calories in rural India, the monthly per capita expenditure at which the calorie intake just met these norms could be taken as the pension amount. National Sample Survey data from quinquennial consumer expenditure surveys were used to determine these cut-off levels, and, expressed at prevailing prices, they came, in round numbers, as a weighted average between urban and rural areas, to Rs 2,000 per month in 2012, which would work-out to around Rs 3,000 today. The number of potential beneficiaries was estimated by the Parishad in 2012 to be around eight crore, which by now might have increased to about 10 crores. The annual amount required for providing old-age pensions at Rs 3,000 per month to these beneficiaries would therefore come to Rs 3.6 lakh crore; allowing for a 5% deduction on account of voluntary drop-outs, what is required is just about 2% of the country’s current GDP for financing a universal rights-based pension plan. The question often raised against such a plan is that the country cannot afford this amount. But 2% of GDP, it should be noted, is less than a third of the annual increment that occurs in GDP at present. The provision of this amount of pension, if it is financed through taxes paid out of incomes, would not imply any decline in the average post-tax income of the non-pensioners compared to the preceding year. On the contrary, it would still mean that compared with the preceding year their per capita post-tax income would increase by about 3%. The payment of pensions on this scale, therefore, does not require any absolute sacrifice by the non-pensioners compared with the preceding year, only a smaller increase in income than would have occurred otherwise. Nobody in short needs to be squeezed in absolute terms for paying out pensions that provide a minimum living standard to the elderly. We have assumed above that pensions would be paid out of taxes on incomes; but this is unnecessary. A Tobin Tax on currency transactions, or an increase in the existing tax-rate on stock market transactions, or a straightforward wealth tax would be a far more appropriate way of raising resources for pensions, since it would simultaneously serve other purposes such as curbing speculation or reducing wealth inequality. In fact, if we assume, somewhat conservatively, that private wealth amounts to four times the GDP, and that the top 1% of households in India owns 62% of the total private wealth, then a mere 0.8% tax on the wealth of just the top 1% of households would be quite enough to finance a universal rights-based old-age pension scheme providing minimum benefits. India’s pension scandal can thus be ended quite easily; why it persists is not any shortage of resources but sheer class-antagonism, since the overwhelming bulk of potential beneficiaries are, or would have been, workers, artisans, craftsmen, peasants, and agricultural labourers.